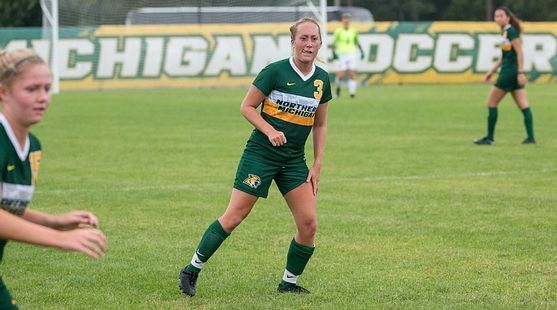 HAMMOND, Ind.---Northern Michigan University Women's Soccer played to a 1-1 draw against the University of Southern Indiana Thursday evening at a neutral site in Hammond, Indiana. It was the first overtime match of the year for the Wildcats and their first draw since October 1 of last season. Erste in now the second Wildcat freshman to score a goal this season, joining forward Taelor Moore (Warren, Michigan) who scored the Wildcats first goal of the season. Another freshman scored her first collegiate goal on Thursday when forward Rachael Erste (Rockford, Michigan)netted a score in the 10th minute. The first goal of the game came with an assist from junior defender Gaelin Hirabayashi (Ijamsville, Maryland) who also recorded her first point of the season. Both teams found their offensive rhythm in the second half with a combined 16 shots, 10 of which were on-goal. The Wildcat defense was able to thwart the USI attack for much of the second half until the Screaming Eagles managed a goal at 86:06. The score sent both squads into their first overtime match of the season.At the half, the Wildcats owned the 1-0 advantage on the scoreboard and a 6-3 shot advantage. The first half began slowly for the Screaming Eagles as they failed to attempt a shot on-goal until the 42nd minute of play. Southern Indiana outshot the Wildcats in the second overtime period for the first time in the match, 2-1. Despite 31 total shots for the contest, 19 from NMU and 12 from USI, neither team could take an advantage on the scoreboard over the final 24 minutes of play. The draw was the first of the season for either team. For the season, Frontuto has 17 saves and a .810 save percentage. Her 1.24 goals against average has led her to a 1-1-1 overall record in the early part of the season. Sophomore goalkeeper Brianna Frontuto (Luxemburg, Wisconsin) garnered another start between the posts for the Wildcats, making her third of the season. She recorded six saves in the match including three in the second half after a strong attack from the Screaming Eagles. NMU finishes their road trip on Sunday against Lewis University. The Wildcats lead the all-time series, 4-2, with the Flyers taking the last matchup in 2013. NMU earned a victory in the series each season between 2006 and 2008.